I've got my bike all pack up and ready to go. 3 paniers on the back and a bag on the front. Tomorrow morning Ben and I head out for a 6-day biking and camping adventure over the Cascades and back, hitting Wenatchee and Chelan (I think) ranging from 350-400 miles. I've never done anything like this, but Ben is a veteran, and he says I will be ok, but in case I don't make it back, I want a big funeral and lots of uncontrolable sobbing. 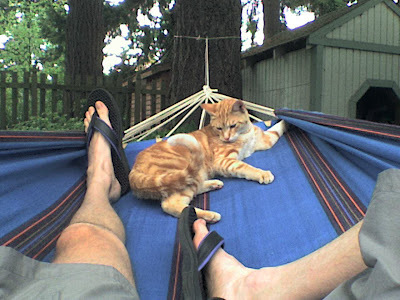 Put a hammock up the other day. Gotta say, it's pretty sweet. 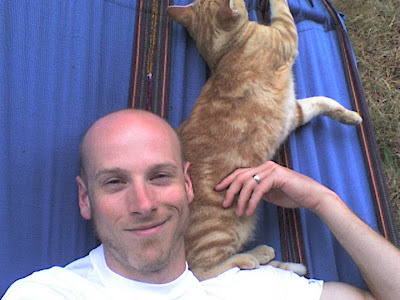 Never had a hammock before. Goldie the neighbor cat (Mojo's buddy) came and hung out with me. Not working rules. 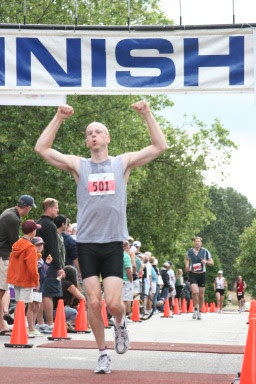 Adam and I competed in the Seafair Triathlon last weekend. It was a sprint, so 1/2 mi swim, 12 mi bike and 3 mi run. I was waiting to get the pix from the event photographers to make this post, so FINALLY they have come in and there were a couple good ones. I'm not sure if it was nerves or the exursion or just eating too much the evening prior or morning of, but I felt like I was gonna hurl about 25% of the race. But I did not hurl... and the race went really well - I had fun and went pretty fast. It was really cool, too, to have Kathleen, Mom and Loren, and Janae and Jeana down there. Afterwards we went out for a nice big breakfast... and I followed that up later with a bacon cheeseburger, milkshake, and then some beer. 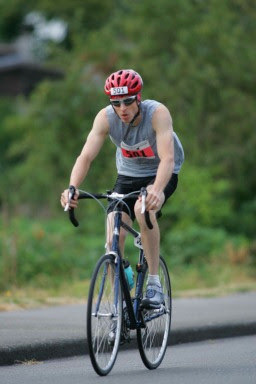 Adam and I have are now signed up for another triathlon on August 25th. My buddy Ben has threatened to sign up, too. We bought Kath a comfort bike yesterday. It's a GIANT Cypress... powder blue, 21 speeds, grip shifters, shocks on front forks and on seat post, and she freakin' LOVES IT. Then we went out for a 13 mile ride along the Burke Gilman and went and had some Thai. Saw bunnies, wild roosters and a blue herron. Finally, FINALLY, got my motorcycle back on the road. It was out of commision for a little while. Put a new battery in. Cut the old pipe off. Had a guy do some welding. Fashioned a little bracket for the heat shield. Looks, runs and sounds better that it has in years. I'm pretty excited about this new saw. I got it free thru the place I used to work. Even at first glance you'll notice the improvements from the old one: it has degree measurements so I'll actually know the angles I'm cutting... AND, it has a real dust bag to catch the sawdust instead of an old plastic carrot bag duct taped on! This post is for Lydia and Gene because you both expressed your appreciation of my cycling googles. These are my motorcycle goggles. They're over 10 yrs old now and have seen many miles, re-applications of hot glue and lots of duct tape.